A cold rash on the face may result from a condition known as cold urticaria. When skin is exposed to cold conditions, red, itchy welts (hives) can appear. Cold urticaria symptoms can range from mild to severe. Systemic, whole-body reactions are most commonly observed after swimming in cold water. Many signs of cold urticaria develop soon after skin exposure to cold water or a sudden decrease in air temperature. It is usually seen when the outside temperature goes below 39°F (4°C), but sometimes it occurs at warmer temperatures. Wet weather makes cold urticaria more likely to happen and you may also develop the condition as a wind rash. Cold urticaria may take weeks, months, or even longer to clear up without treatment. Temporary hives on the exposed area. Swollen hands when holding cold objects. Swelling in the throat and lips when drinking cold liquids. An increase in the severity of symptoms when skin is warming up. If you experience any rash from cold conditions, make an appointment to see a doctor to rule out any underlying issues that may predispose you to these reactions. Swelling in the tongue or throat. Anaphylaxis – a whole-body response to the cold, with a quickened heartbeat, swelling in the limbs and torso, shock, and possible loss of consciousness. Severe reactions are most likely after full exposure to cold conditions, for example, by swimming in cold water. The subsequent cold urticaria may cause loss of consciousness and is a risk for drowning. Although there is currently no cure for a rash from the cold, there are measures you can take to prevent the condition or to ease your symptoms. OTC drugs. Anti-histamine medications prevent the release of histamine, which is responsible for many cold urticaria symptoms. Anti-histamine drugs include loratadine, fexofenadine, cetirizine and levocetirizine. Prescription drugs. Cyproheptadine acts as an antihistamine and controls the nerve impulses leading to cold urticaria symptoms. 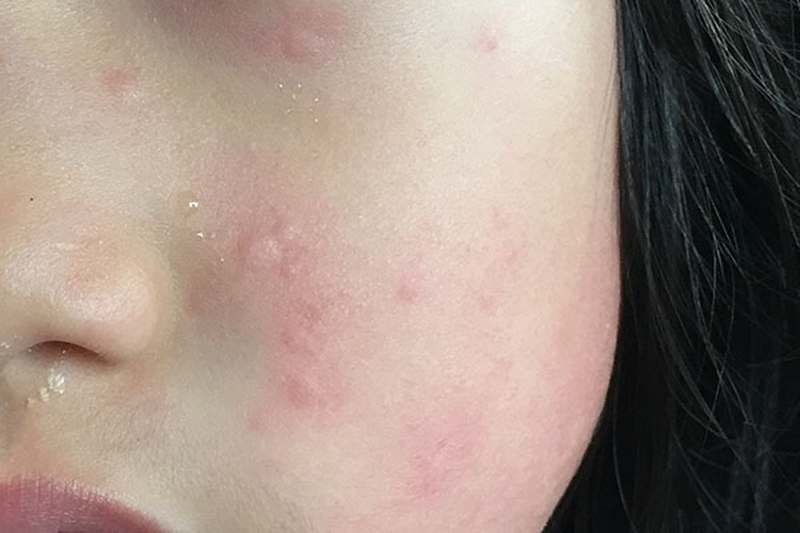 Cold urticaria can also be treated with medications developed for other conditions, such as the asthma drug omalizumab or the antidepressant doxepin. Avoid cold temperatures. Try to prevent your skin being exposed to sudden drops in temperature. Wrap up when going out in cold or wet weather, and take steps to protect against wind rash. Most importantly, don’t swim in cold water. If you have taken appropriate measures, but are not seeing an improvement in your symptoms, ask your doctor if there are any prescription drugs or combinations of medications that could work. If you have secondary cold urticaria due to another condition, make sure you receive the appropriate medication to keep your primary illness under control.